The Treat Puzzler actually has a maze inside the ball. Made from natural rubber infused with vanilla extract. This interactive treat ball holds the prize inside, encouraging active play to produce the reward. A fantastic training aid. 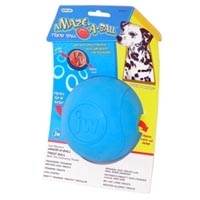 Great for small dogs and puppies this durable ball will not only keep your pet busy but will last and last. Treats to fit each size ball are recommended on the packaging.